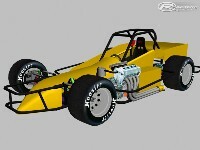 4c Supermodified are a small touring series in the NY, NJ, PA area. They are powered by 600cc Motorcycle engines, and are approximately 5/8 scale to real supermodifieds. My reference to similar cars seen at Osewgo was to similar size to this 4c concept but I believe the engines were around 600 cc. These may have been refered to as TQ Midgets or TQ's. Many of these ran in Canada and put on a good show, but I think would be better served with modified 2.3 liter size turbo charged motors running E85 or 95. Admittedly the TQ's might be better suited for indoor winter racing. This is a great concept but shjould not be compromised by smaller engines. Remember these are speedway Supermodifieds not Go Karts or Formula sports racing cars. From past experiences at Oswego I remember this class racing with a larger group of similar race cars from Canada. Also works veery well for indoor winter racing. My hope was that an asphalt turbo 2 - 2.3 liter division of appropriate (365 Bhp.?) cars could be developed to run with the Midgets and a longer wheelbase 750 Bhp. developed to run with the Supers at a slightly lighter weight. Eventually perhaps a class to run at Indy with top speedway drivers and bring the fans back to the speedway based on the latter class. No real new news, I had a lot go on in my personal life and everything got shelved. Given the right group of people and some free time and it will get finished at some point. Is this mod officially dead?